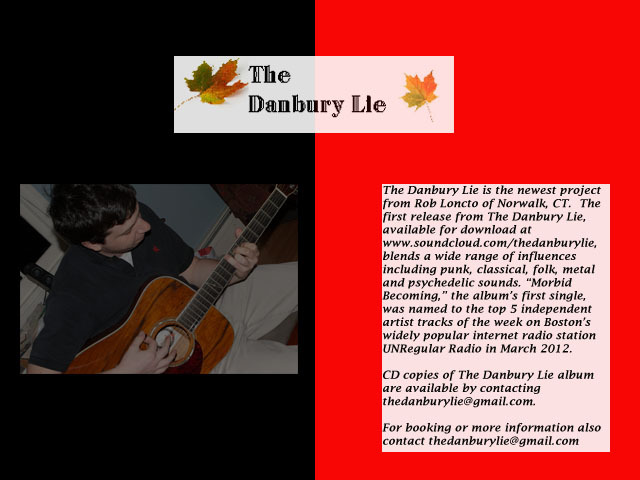 Recently featured on CTIndie's Summer Mixtape D60 (on side A of the RED tape), The Danbury Lie sent us a link to their new record, eponymously titled, which is a well crafted set of like-minded songs. The album is presented below in 1 single stream containing all tracks in order. "In Living Sin" starts off with a pretty guitar intro and then steps up to a call out to all "Go out in living sin!". This is a great intro to this record and sets the pace for the remaining songs. "Morbid Becoming" is the clear single. It's a strange mix with the rhythm and attitude perfect for a track 2 single. Creepy but traditional, interesting but not intrusive. This was the track submitted by The Danbury Lie for our Summer Mixtape (where it fits perfectly!). "The Tyrant" is a grooving anthem. The steady beats and low end acoustic riffs march this song through sounds reminiscent of everything from 60's hippy grooves to a bit of later era Fugazi. This song, like the ones before it, is pretty expertly composed with a number of details nicely executed. Awesome slowed down outro finishes this song. In "Gun Shy" an eerie guitar lead battles a jangly bass riff over meandering vocals. There are some very nice vocal harmonies in this song. "2012" is an apocalyptic groove out with spoken words and some American history. This riff and beat of this song also gave me a bit of that Fugazi vibe. Additionally I admire the methodology behind this nearly raw/bare sound. Very few effects are utilized, leaving the musicians to play the raw spirit of the songs. "Dotted Line" definitely has some 80's metal influence. Creepy to the core and filled with darker melodies, this one throws the mood in a different direction. "Please Arrest" is a chill last song, still eerie but triumphantly so. A proud march at the finale of a bold set of songs, all recorded raw and gimmick free for you to hear and make up your own mind about.